Cintra Street, Penang.... best Yao Char Kwai! 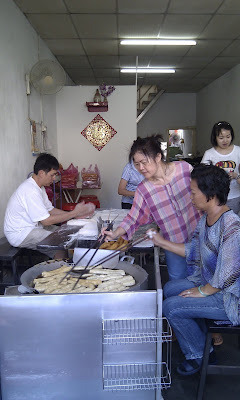 Penang is my favourite destination for a short trip in Peninsula Malaysia, mostly because of its food. The drive is is approx 3.5 hours though recently in 2010, I've managed one way in 2.5 hours in a 1.5litre 4 door saloon car. 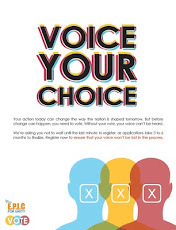 I suppose many Malaysians have tried this before, judging by the number of posts you see in other blogs, but no harm in spreading the word around. It's just the best. I guess coconut oil is added into the frying oil, as the aroma of the former was recognised, thankfully in a controlled dosage. Great texture, crispy and that coconut oil just wraps this piece of Chinese delicacy to another level. Fu Gua Thong Restaurant, Kuchai Enterpreneur's Park. I grew up not liking a lot of things, food included. In no particular order, brinjal, bitter gourd, petai, ladies' fingers and DURIANS. Recently though, bitter gourd and petai have slowly made its way into my tastebuds' acceptance list. At a ripe old age of 34, it's still not too late i hope, since we've received numerous e-mails from doctors and professors who swear by the benefits these 2 possess. This restaurant is a branch from the one you've been to in Bandar Puteri, Puchong with its origins from Johor. Being first timers here, my wife and i ordered signature dishes recommended by the captain - bitter gourd soup, sweet potato leaves in belacan and fried pork belly. This soup is definitely one of the better ones I’ve had, appearing very close to the “Bah Kao” soup you can order in most Hokkien noodle places. The bitter gourd was flavorsome, bitter (of course) and has a slight crunch to it. 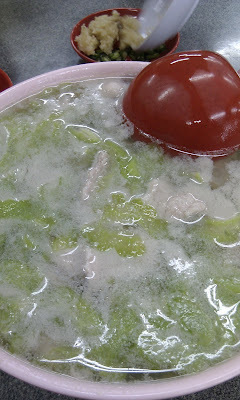 Quite clearly, the bitter gourd was not left to boil in the soup thus retaining its flavor and texture. The pork slices were thinly sliced with a lil’ fat left on top for that ideal balance in every bite. 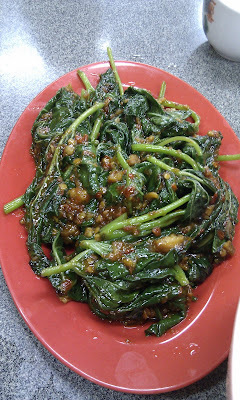 The potato leaves stir fried with belacan was also up to par. Spicy and finished with tiny pieces of fried pork lard for that impeccable balance of sweetness, spiciness and smoothness. Serves up a great dish to go with the bitter gourd soup. The fried pork belly was good, though the serving was not as much as I’d expect for a “small” bowl. It wasn’t even a bowl to begin with, more like a bigger saucer that you use in dim sum restaurants. Still, the pork was crispy and tender with no excessive fat. The aroma of the fermented bean curd isn't that strong, but just nice to most tastes. This meal cost RM27, which I think is pretty good value considering that they use only small bitter gourds which are better in taste and texture and more expensive. Pan Mee at Jln Beremi, behind HSBC Jln Sultan Ismail. I was introduced to soup noodles pretty late I'd say, because when i was young, i dislike food being served "temperature" hot. Nasi Lemak however, was fine. Growing up in United Garden, Old Klang Road, Pan Mee was more of an alternative since the fish and pork ball noodles were very good. In came the infamous fried pan mee just after Jalan Sepadu, United Garden which made headlines around town, so much so that during its heyday, the pan mee would've been sold out just before 8pm. Fast forward to my working days here in Kuala Lumpur and i was introduced to a very special pan mee stall just at the back of HSBC Menara Genesis along Jln Sultan Ismail. It operated from a stall just behind the shophouses with approx 5 to 6 tables back then. It then moved into proper shophouse just around the vicinity, bearing the name Restoran Jangan Ketawa. It's now further up the road, just next to Fortuna Hotel, off Jln Beremi as per the picture here. I love the pan mee served here. It's a close one this, as Jalan Raja Laut's famous chilli pan mee has also garnered a cult status for itself. You have loyal followers who'd swear by the pan mee served. Like most places, you can have your pan mee served in 2 different styles, dry or soup. Dry's my style as it's easier to eat, without my head dripping sweat like a running tap. Mind you, this place is not air-conditioned. Here's a picture of the noodles served dry. As you can see, the noodles is served with fried anchovies, sliced mushrooms and minced pork. The gravy is slightly on the sweet side, but i can assure you, you'll like it. It's not overly sweet but balanced enough to bring the best out of everything served. Vegetable, in the form of potato leaves is served in a bowl of soup. Fish and pork balls are extra add-ons at cost. More on that later. Next up, for soup lovers. I quite like it served in soup but as mentioned, having the soup version is best done when the weather is cold, or when it rains. We did however, run into a short period of approx 3 to 4 months this year of rain almost everytime we came here for pan mee, so long as our Ms Drama Queen colleague came with us. She brings rain and requests for an egg in the soup. Aside from the usual chilli paste, you could also add chilli flakes for that extra zest. Caution though, the chilli flakes are very potent. Those with weaker digestive systems might be in for a ride. The aftermath.... usually the case. You could however, have a "set", a bit like their version of a Happy Meal. You get the noodles, soup, fish and pork balls, a drink and a pack of Premier Tissue Paper. The banner below no longer applies, as the price has been revised upwards a couple of months ago. My tummy rating: 9.2 / 10.